For the roasted sweet potatoes: Preheat oven to 400˚F. Prepare a baking sheet with foil and spray with non-stick cooking oil. Peel the potatoes and cut then into small cubes (1/2″-1″). Toss in a bowl with enough olive oil to coat all the pieces. Season GENEROUSLY with salt and fresh pepper. Lay the cubes out on the baking sheet in one layer. Bake for 20-25 minutes flipping the potatoes half way through. To brown and crisp them a bit more, broil on high for 2-4 minutes. Careful not to burn them! For the tahini: In a pestle & mortar, crush the garlic and coarse salt until it is completely paste-y. There should be no chunks. Add the tahini paste and lemon and mix until combined. Add water, parsley and mix again. It should be fairly loose. If the tahini is too thick, add another tablespoon of water until you’ve achieved desired consistency. You can also do this in a food processor if you either don’t own a pestle & mortar, or if yours isn’t big enough to hold all the ingredients. For the lemon dressing: Whisk all the ingredients together. 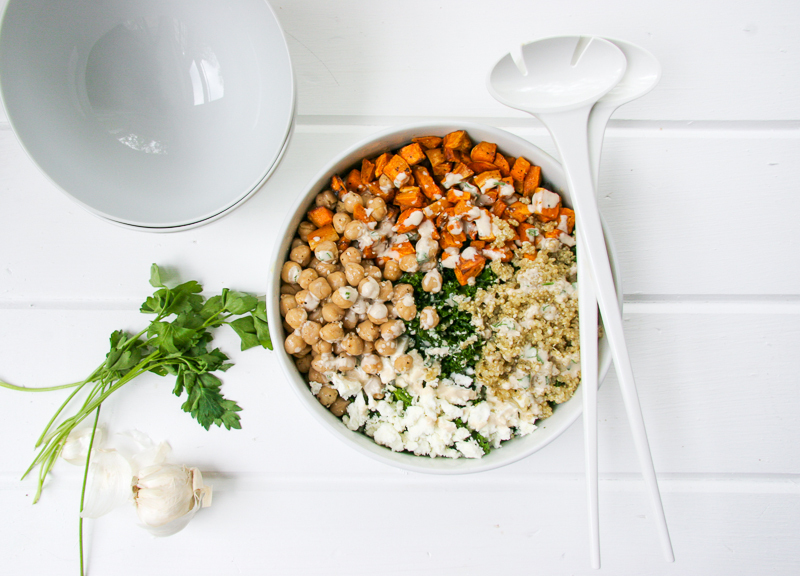 For the bowls: Toss the chickpeas with about 2 tablespoons of lemon dressing in a small bowl. Set aside. 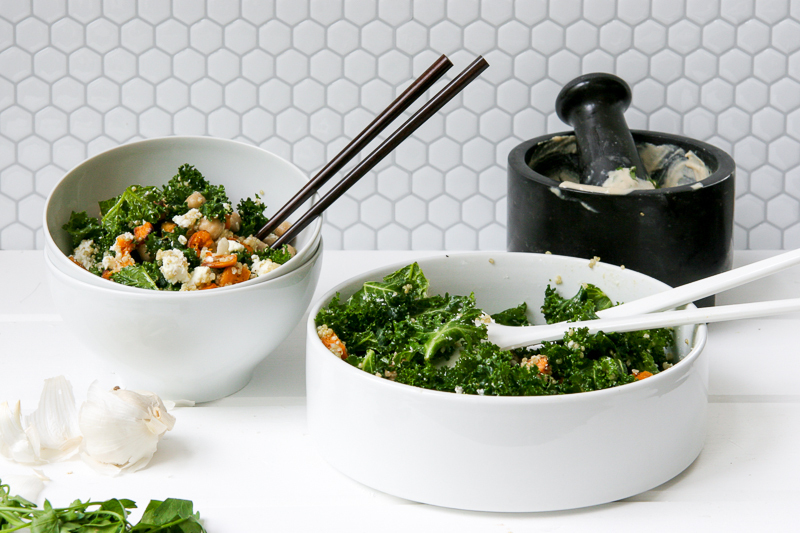 In a large bowl, toss & massage the kale with the remaining lemon dressing, some salt, and fresh pepper. Massaging the kale will break down some of those tough fibers and make the kale a bit softer. 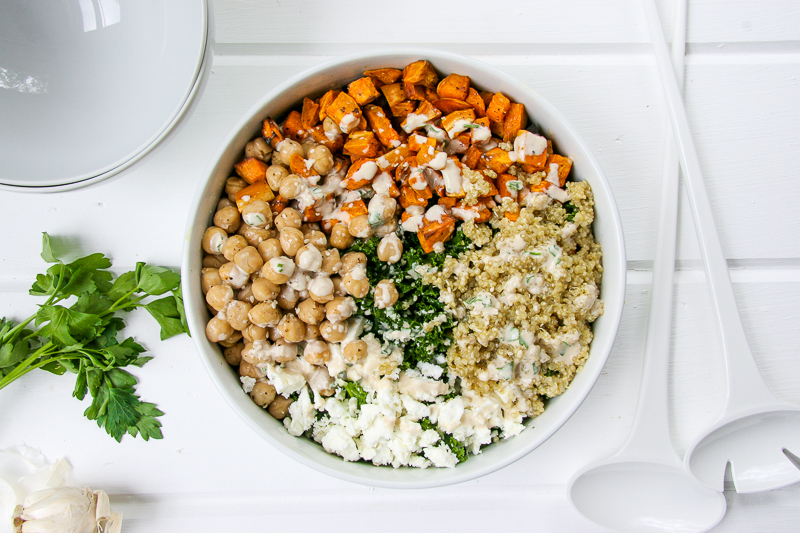 Top with the roasted potatoes, quinoa, chickpeas, and crumbled feta. Drizzle with tahini. Use as much or as little as you like. 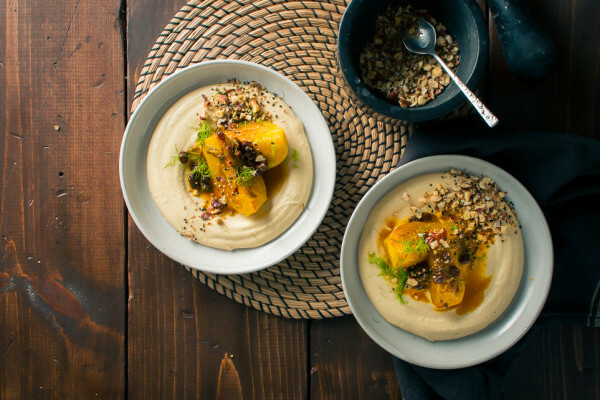 You can serve the rest of the tahini on the side as well. Garnish with sesame seeds and season with salt and fresh pepper. 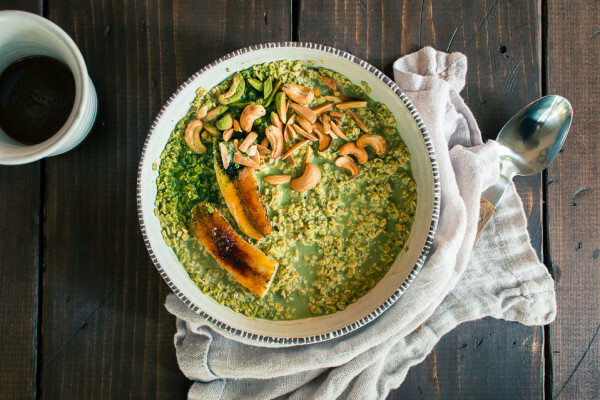 Cook your quinoa in chicken or vegetable stock. Please! I know I’m repeating myself. But it really does make such a difference. 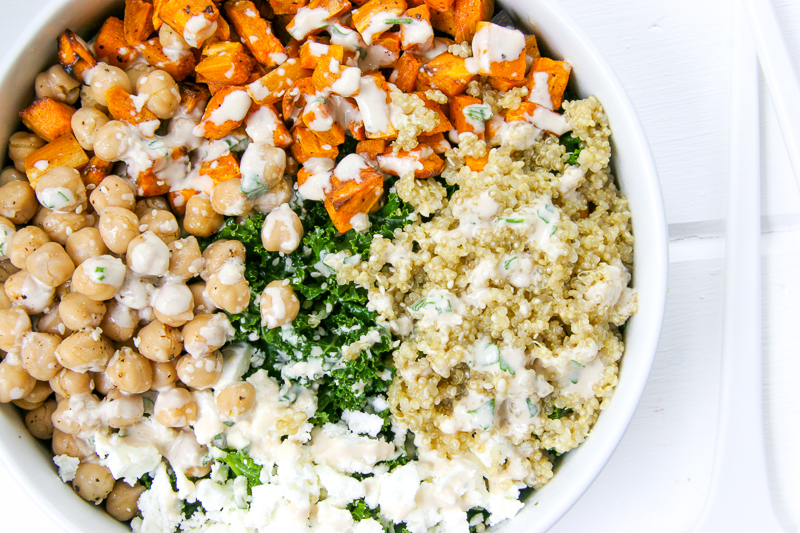 Seasoning and dressing each component of a salad turns a good salad into a great one. Treat each add on as it’s own little dish, making sure each component is delicious before adding it all together. This is called a “composed salad”. This is perfect for a lunch to bring to work. You can dress it in the morning and it will still be perfect in the afternoon. Unlike, spinach or mesclun mix, the kale really holds up even though you’ve dressed it ahead of time. Of course!! Thanks for the wonderful compliments! I love this recipe very much. =) Thanks Vicky! Made this for my husband and I tonight…it was surprisingly easy, and we LOVED it. Seriously, so so good. Can’t wait to eat the leftovers for lunch tomorrow!! Excellent! So happy it was easy and tasty at the same time! Enjoy! This was seriously amazing. I will make this again. Thanks for sharing. Thanks Janel! Happy you enjoyed it! I just made this for dinner for my mom and I. It is AMAZING. We both can’t stop eating it. Thanks so much for the wonderful recipe! Woo!!! Thanks Molly! Happy you and your mom enjoyed it! I made this last night with the addition of some shredded roast chicken for my “must have more protein!” boyfriend-and what a hit. He even requested I pack it up for lunch for him the next day. That NEVER happens. 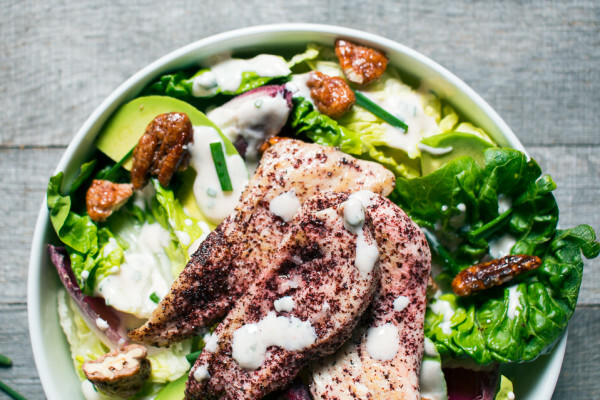 One question though-when I made the Tahini dressing everything was great until I added the warm water. Then it basically separated and became very chunky and I could never get it smooth again. Any thoughts/suggestions here? That’s wonderful!! So happy you guys enjoyed it!! I know about the “must have more protein” bit. I get it very often from my husband. For the tahini… it happens. Try mixing with a fork or a whisk and giving it some good whipping. Also, try streaming in the water slowly as you whisk it. If all else fails, use a food processor to make it or a blender. That will definitely do the job. Let me know if that helps!! This was absolutely amazing. Will be one of my new staples for sure!!! I added avocado, which was a delicious choice. Also, for some reason my tahini was a little bit too thick so I added a bit more water/oil/lemon to get it to the right consistency. Amazing recipe, thank you thank you!! MMMMM!! Adding avocado sounds awesome. I’ll have to give it a shot. Thank you! Happy you enjoyed it! Is this enough food for dinner, or is this more of a side? I would say it’s enough for a dinner for 2 or a side dish for 4. Hope that helps! Do you have any nutritional stats? When u plugged this into My Fit Pal, it came out with astronomically high cals! I think mainly in part to the amount of evoo and tahini paste? For the dressing, is all of it used in the recipe? Id really like to try this! Hey Lauren! 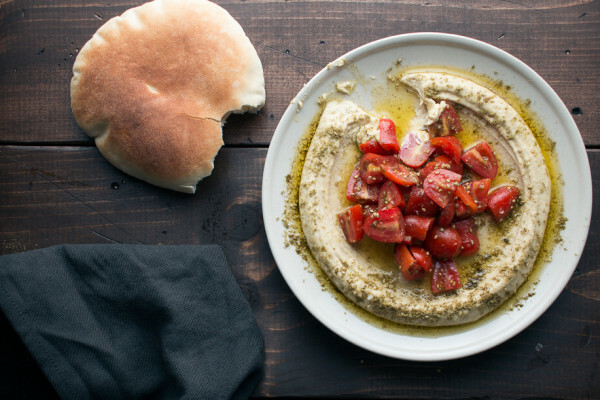 Yes, tahini paste is always going to have a ton of cals. You’ll definitely have a lot of dressing left over after you’ve dressed the salad. If I made an general estimation, I would say that you would need 1/6 of the dressing for each serving. I hope that helps! everything looks great, do you have a per serving calorie count on this. My calculation ends up around 1200… Is that correct? Hey Dustin! I do not have a calorie count on this baby. If you entered in the amounts listed for the dressing, that might be why it is so high on the calorie end. The dressing recipe serves 6 and not 4 like the rest of the recipe does. I always like a bit of extra =) Let me know if that helps! WOW i just tried this tonight. It’s delicious!!!! Thank you for this combo salad! Wooo!!!!! Happy you enjoyed it! 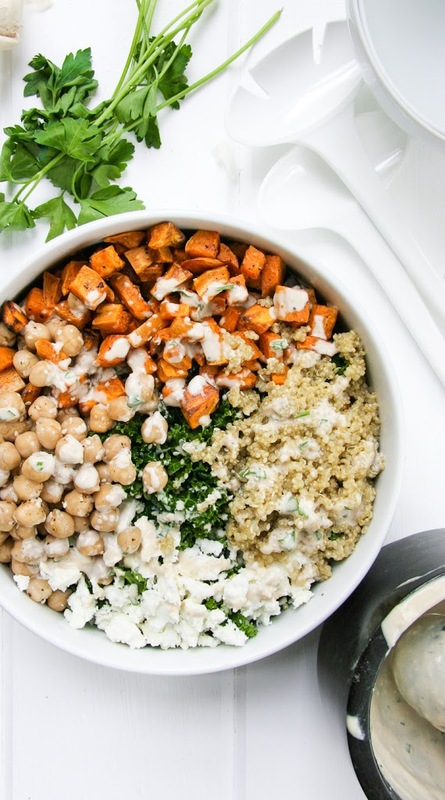 Trying this for lunch–my husband is not a vegetarian and he does’t really like sweet potatoes. Wish me luck. Looks amazing! This is the most delicious thing I’ve eaten (let alone made myself) in a really long time. 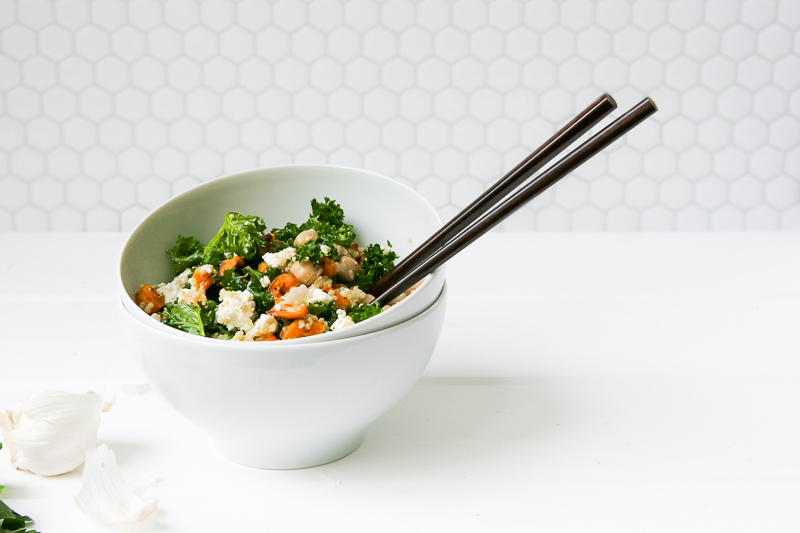 I forced my quinoa adverse hubby to try and a bite and he asked me for leftovers to take to lunch – I almost fell over with shock. He works in a male-dominated industry and had a co-worker try and this guy demanded that I send him the recipe! I followed the recipe exactly, except I subbed goat cheese for the feta, which I would highly recommend anyone trying. I cannot thank you enough for this life-changing recipe!! That’s so nice to hear!!! Happy you really loved it!! And thank you! I made this last week and I couldn’t stop gushing over it. I added a little siracha on top for a little something extra. SOOO delish and perfect for lunch. I put the kale in ziplock bags, then dressed them and “massaged” the kale/squeezed the bag right before I ate it. NICE! That sounds amazing. Thank you!!! So happy you enjoyed it! how long does the tahini keep for in the fridge? Hey Lauren! I’ve really only kept it for a day or two at most. Sometimes it needs to be re-whisked if it separates. I just made this without the cheese and it was still great. I also added beets… Love grain bowls! I made this last night, and am eating it now for lunch (next day) as I am writing this comment. It is very good; however, I found the feta cheese too overpowering. Maybe 1 cup was too much for me. I found myself painstakenly removing the bits of cheese. 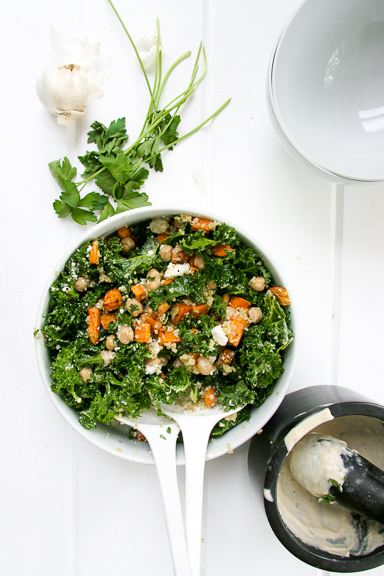 This being said though, I will redo this delicious kale recipe but either skip the feta cheese or replace it with a milder one like queso fresco or bits of mozarella. My next project is to make your Turkey Leek Meetballs. Thanks! Hey Regine! Some feta cheeses can be real stanky. If it was too much for you definitely leave it out! And sometimes you need more water for the tahini. It really depends on the brand you use! Happy you used your good judgement and kept adding more water until it was dressing consistency. Thanks!! I also forgot to add that like with another user 2-3 tbsp of water for the tahini dressing was not enough. I think I ended up adding twice as much water. Or maybe it is because I did not slowly add the water but I did it all at once. Thanks! Thanks for planning dinner! Fantastic! 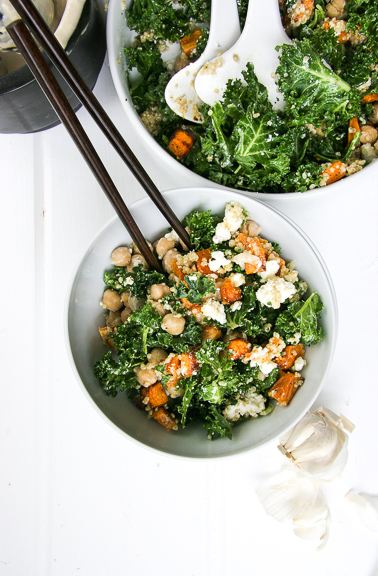 I had a similar kale salad bowl at a restaurant recently and found myself craving it and wondering if I could recreate it today.